Federal, state and local officials celebrated the opening Tuesday of the state Route 76 East Project – the final of three between Interstate 15 and Interstate 5. The $202 million project relieves traffic congestion, improves safety and protects the environment, Caltrans said. “This project provides an example of the department’s commitment to build projects that provide new transportation choices while enhancing and protecting the environment and the livability of adjacent communities,” said Caltrans District 11 Director Laurie Berman. 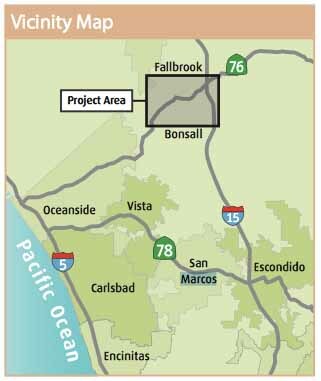 The SR-76 East Project stretches 5.2 miles from South Mission Road in Bonsall to I-15 in Fallbrook and serves local, intraregional and interregional traffic. It included construction of a new SR-76/I-15 interchange and expansion of the SR-76/Old Highway 395 Park and Ride, increasing parking capacity and adding electric vehicle charging stations. The realigned and widened four-lane highway also now has a center divider, improved sight distances, updated bridges over the San Luis Rey River and standard width shoulders in each direction to accommodate bicycles, pedestrians and emergency parking. These combined features provide motorists with a conventional four-lane highway connecting the city of Oceanside, and the unincorporated communities of Bonsall, Fallbrook, Pala, Pauma Valley, Rincon and Lake Henshaw. A key attribute of this project was the Environmental Mitigation Program that slated $80 million in TransNet funds to preserve and restore habitat adjacent to the SR-76 corridor between I-5 and I-15. In total, close to 1,600 acres of property were purchased to support habitat conservation and the San Luis Rey River Park Plan in this corridor. “Today marks the completion of another one of SANDAG’s high-priority transportation projects, a promise made through its TransNet Early Action Program,” said SANDAG chair and county Supervisor Ron Roberts. Earlier improvements included the SR-76 West project from I-5 to Melrose Drive completed in 1999, and the SR-76 Middle project from Melrose Drive to South Mission Road completed in 2012. 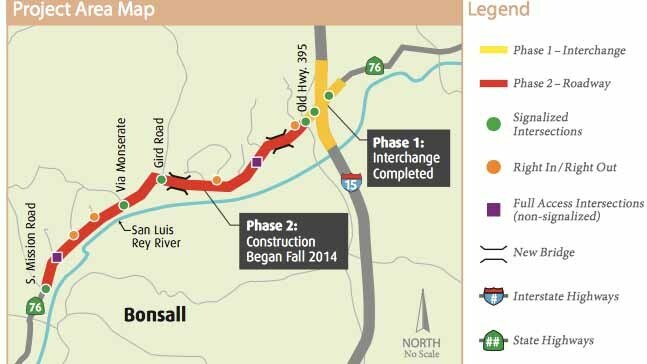 The project was funded with the regional TransNet half-cent sales tax for transportation, federal funds, developer fees, county of San Diego Transportation Impact Fees and contributions from Native American tribes. Project information is available at KeepSanDiegoMoving.com/SR-76-Corridor.